While the Internet may still be divided over their choice for the next Darna, it seems Erik Matti has already made up his mind. 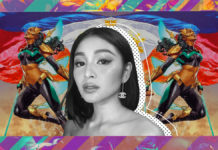 The acclaimed director, who previously helmed the project before quitting last year, would’ve picked Nadine Lustre to replace Liza Soberano if he had it his way. ‘After her, I only see Nadine Lustre so far as someone who can be Darna. Very sultry. She has a lot of female sensuality and at the same time still looks tough and very Filipina’, says Matti in an interview with PhilStar.